Within the broader context of the global knowledge economy, wherein the "college-for-all" discourse grows more and more pervasive and systems of higher education become increasingly stratified by social class, important and timely questions emerge regarding the future social location and mobility of the working classes. Though the working classes look very different from the working classes of previous generations, the weight of a universal working-class identity/background amounts to much of the same economic vulnerability and negative cultural stereotypes, all of which continue to present obstacles for new generations of working-class youth, many of whom pursue higher education as a necessity rather than a "choice." Using a sociological lens, contributors examine the complicated relationship between the working classes and higher education through students’ distinct experiences, challenges, and triumphs during three moments on a transitional continuum: the transition from secondary to higher education; experiences within higher education; and the transition from higher education to the workforce. 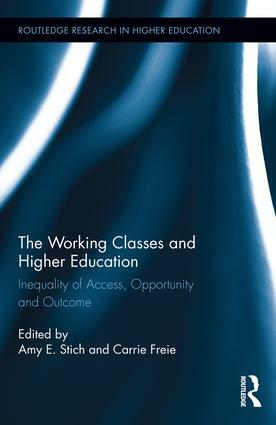 In doing so, this volume challenges the popular notion of higher education as a means to equality of opportunity and social mobility for working-class students. Amy Stich is Assistant Professor of Foundations of Education at Northern Illinois University, USA. Carrie Freie is Associate Professor of Education at Pennsylvania State University, USA.